What if a group of American soldiers found a map to Saddam Hussein’s hidden gold stash amidst the cease-fire of Operation Desert Storm, and decided to take it for themselves? What if, somewhere along the way, they had a clash of conscious as they witnessed Saddam’s Republican Guard gun down Iraqi civilians of the 1991 uprising all around them — the very same Republican Guard with whom they had just been ordered to cease fire? What might happen? That, in a nutshell, is David O. Russell’s Three Kings. Pigeonholing David O. Russell’s Three Kings into a single genre is difficult, as it is one of those rare genre-blenders in Hollywood (but common in South Asian filmmaking) that mixes and matches comedy with the war film, or other more serious genres. 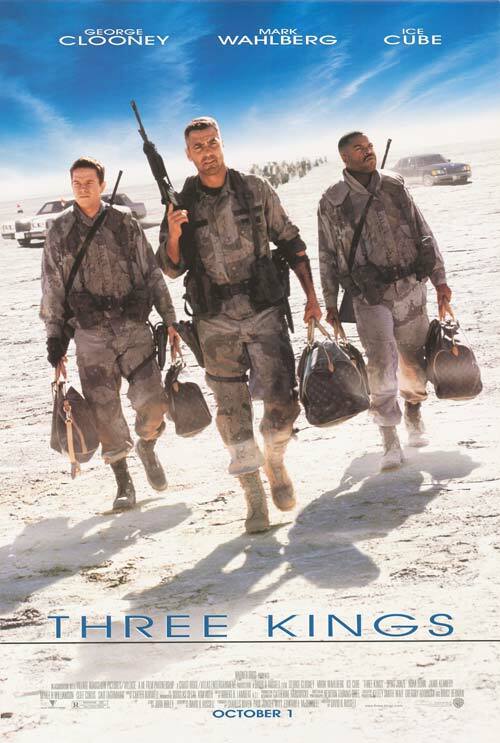 Three Kings, at its core, deals with serious themes and serious subject matter surrounding the end of the first Gulf War, and is therefore a war narrative before anything else. That being said, it’s refreshing how Three Kings doesn’t drown in its cynicism, isn’t exploitative in terms of gore or shocking violence, and isn’t hitting its audience over the head with either jingoistic propaganda or hamfisted pacifist social commentary. Moreover, Three Kings (TK) is funny enough often enough to be qualified as a comedy in its own right. It’s the humanist, dare I say, heartfelt combination of the two, that makes it a bonafide winner. Most of the humor is used to illustrate the film’s sociopolitical subject matter in an effective, out-of-left-field sort of way. It’s a great story that’s told in an idiosyncratic manner, in other words, and that’s a large part of the movie’s charm. Left: George Clooney (far left), Mark Wahlberg (center left), Ice Cube (center right), and Spike Jonze (far right). Right: Greed for gold is what starts this off-kilter, wacky war story. Russell, later director of 2010’s The Figher and writer-director of 2012’s Silver Lining’s Playbook, does a fantastic job bringing the action set-pieces and Middle Eastern desert landscapes to life. It is a great mix of intense shootouts, chase sequences, and unconventional comedic punch lines. He emphasizes the emotions of his talented cast with a finesse rarely seen in a movie this versatile and multi-talented. Stars George Clooney, Spike Jonze, Mark Wahlberg, and Ice Cube give fine performances as the initially greedy but later conflicted servicemen. They play stereotypes, yet they play them in a likable way that makes rooting for them an effortless, enjoyable experience. Plus, it’s fun to watch such a diverse cast of personalities clash and later work together on screen. The conclusion to their story is immensely satisfying and wraps up each character’s arc well, and also leaves a playful wink to the audience regarding the final fate of the stolen gold. Overall, Three Kings is a terrific, if bizarre, war-comedy film that mixes satirical gags into its serious themes with depth and efficiency. It’s a film that you won’t see coming, but it’s also one of the better war or comedy films to come out in the last twenty years or so. SUMMARY & RECOMMENDATION: Three King’s wacky premise and unconventional comedic style propel the movie to impressive heights. Few films before or since have mixed the otherwise mutually exclusive tones of comedy and warfare cinema with such style and precision. It’s a war movie alright, but that doesn’t mean you can’t have loads of fun watching it.
? Are we shooting people or what? !